The condylar canal is a canal located in the condyloid fossa of the lateral portions of occipital bone at the back of the occipital condyle. Surgical procedures of the rectus capitus posterior major as well as minor muscles exposes the bony indentation leading towards the condylar canal found posterior along with lateral towards the occipital condyle. It is located immediately superior towards the extradural vertebral artery, which in order to insert in the foramen magnum creates a loop over the posterior CI ring. It is immediately superior to the extradural vertebral artery which in order to enter the foramen magnum creates a loop above the posterior C1 ring. 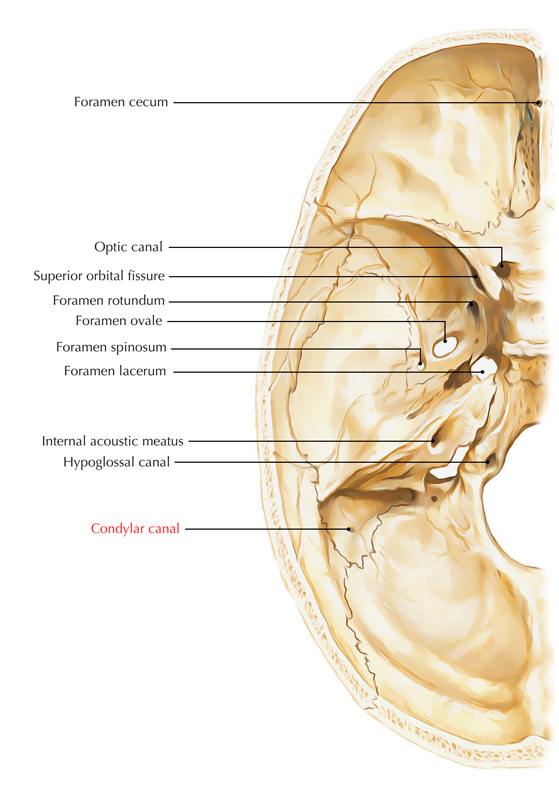 In order to connect with the foramen magnum rim and the occipital condyle the anteromedial wall of the condylar canal condenses. It may show variations of being a single canal or group of multiple smaller canals.